Please refer to our stock # mg1 when inquiring. This fantastic cuff bracelet was made in the pate de verre technique originated by Maison Gripoix. 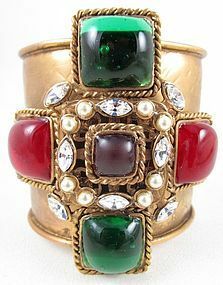 The gilt hammered brass cuff is 2 3/4" wide and the 3" wide pate de verre applied maltese cross has pearl and rhinestone accents. It has a 5 1/2" interior end to end measurement with a 1 1/2" gap opening, and the metal has flexibility to adjust to most average wrist sizes. It has no markings and it is in excellent condition.